Ballast Quay is technically not part of the Peninsula – which begins at the corner of Pelton Road and the riverside – but it is an interesting area and one which has a strong relationship to the development of the western end of the Peninsula’s riverside as well as the streets behind it. Indeed it appears that a stile or gate marked the boundary – described in 1792 as a ‘wicket with lock and key’. Indeed this can be seen on a seventeenth century print. The area is owned by Morden College, and has been since the 1660s. It has been known as ‘Ballast Quay’ since at least the 17th century, it marked as such on Travers’ map of 1695 and seems to refer to the transfer of ballast – perhaps gravel or chalk– into vessels. Such ballast was commonly put into collier ships which was brought coal to London from North-eastern ports and needed a return load. Although Morden College owned many such pits – both in the area of Blackheath Hill and in Chiselhurst – the date of the Travers’ plan which identifies the quay’s name is close to the time of Sir John Morden’s acquisition of the area – and this may mean that it pre-dates him. In 1695 the grounds of a building stretched between Ballast Quay and Crowley House, with its outbuildings on the site of what is now Greenwich Power Station. In later years the area seems to have become part of the complex of warehousing owned by the Crowleys. Ambrose Crowley had bought property in Greenwich in 1704 using it as a warehouse for his iron founding business based on the Tyne. Some of this activity doubtless moved on to the Ballast Quay area. The Roque plan of 1747 shows an undeveloped river bank between Anchor Iron Wharf and the gunpowder magazine By 1792 maps appended to deeds show Anchor Iron Wharf itself heavily built out into the river. ‘Houses’ shown on the western side of the Quay include the Green Man public house, and ‘Green Man Yard’ is marked inland. Near the riverfront is a another – identified as ‘Thames Cottage’ and to the east of that sluices on the line of Pelton Road. The area is shown by Morden College as being leased to ‘Millington’ – Crowley’s Manager and associate. Further research in the Morden College archives might reveal more about the history and use of the quay before 1818. In 1818 Morden College’s Surveyor, B.Biggs, undertook a survey and drew a plan of the Quay, which shows little more than a line of trees and some sluices. It was nevertheless the start of a great deal of work by Biggs on this area. It was, however, not until 1829 that a proposal for ‘a new wharf and improvements’ was made – this shows a ‘proposed new road’ and a ‘proposed terrace’ roughly on the line of the current houses. It is however not until 1838 that another survey by Biggs shows the Union Tavern (now the Cutty Sark) marked and the distinctive line of the houses. Julie Tadman’s ‘A Fisherman of Greenwich’ describes the subsequent history of the quay and the pier built there, as well as the fate of ‘Thames Cottage’ and the article by Mr. Linney the use of the Harbour Master’s House which replaced it. 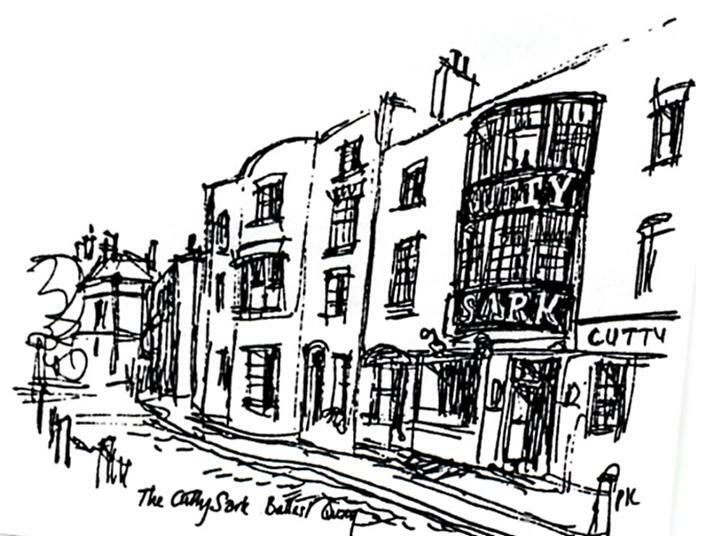 The Union Tavern was renamed the ‘Cutty Sark’ in the early 1950s when the Cutty Sark Ship herself was berthed at Greenwich.